This is strange. I've looked everywhere (community hub, profile, news page, email, etc. ), but I can't find an actual feed of updates from my followed games. The closest thing I've found is this page, but this is specifically for games in your library. It has nothing to do with followed games. This means that the only way for me to see an update is to just happen to be sitting at my computer the exact moment steam pushes the desktop notification. And if I miss that notification (which I will), I'll never know about it unless I spontaneously decide to manually go to the community hub of every single game on my followed list and scrub through the latest news, which isn't even listed in a linear format. It's listed in some weird "staggered grid" format. Time consuming. This is kind of ridiculous. I thought the function of "following" something was that you get a feed of recent updates that you can look at on your own time, whether via email or a dedicated feed. They make damn sure that you know about every sale, from launching a big news window when you start the client, to throwing a huge ad on the front page, to emailing you when a wishlisted item goes on sale, etc. But nothing for followed games? What's the point of following them if I still have to manually visit the community hub (and have no idea if the game I'm looking at has actually updated until the page loads)? In any case, I've been trying to find this elusive feed for months with no luck. I would really like to actually make use of this feature (assuming it actually exists). You can find a feed of updates of the games you follow under 'Activity', which is accessible under your profile name in the menu (in both the browser and client version). You can adjust the feed in 'Friend Activity Settings', at the top (partially visible in the screenshot). I found out a way to see all of your followed games, in case you were wondering; go to your nametage at the top of the screen, and click "Activity" in the drop-down menu. Then, on the right side of your screen, you should see a box with your profile and some buttons. Click "Games." (It has an image of a mouse on it) Now all that's left is to click the "followed" tab at the top, and bam! A list of all your followed games. Hopefully that is helpful to you! RSS feed for major Steam sales? Do people on Steam see my non-steam games? Where can I see which games are up for auction? Is it possible to see a list of which games I have marked as “Not Interested”? 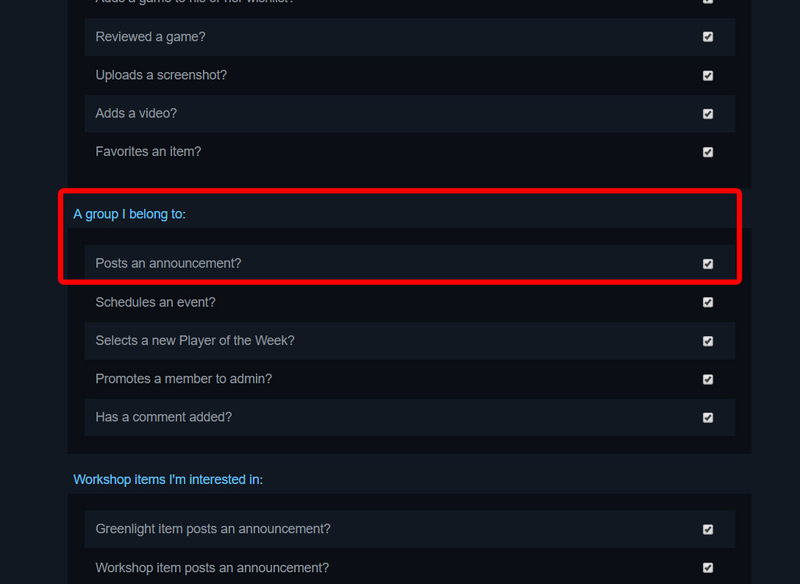 Is it possible to email-subscribe to a game's news on Steam?